Kids and Adults love to gather and create various things! Some people call them “Make-it/Take-it” projects. Bradford Public Library is introducing a new concept for our patrons and that is providing a Makerspace! Makerspaces are in many libraries throughout the United States and even though our library is small & rural – we have made this idea come to life! Offering a space and location to create, build, and craft different items is an additional service that we currently offer our Teens & Adults! BPL will also provide many tools for these handcrafted items. Many larger libraries have an additional room to keep their Makerspace materials and tools, but BPL wanted to be more flexible and provide a Portable Makerspace that can be used anywhere within or outside of the library. 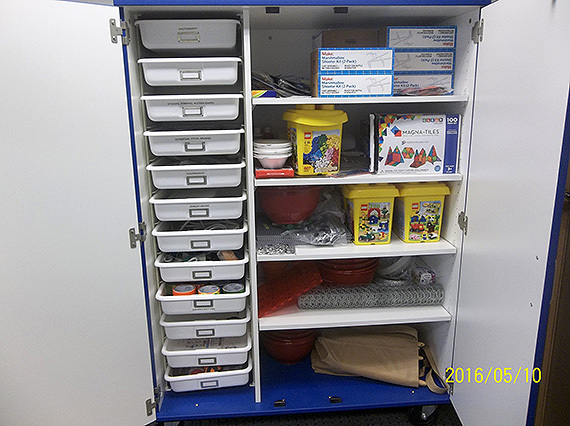 With the assistance of a grant from the Miami County Foundation, BPL was able to purchase a portable cabinet, consumables and non-consumable items to get started. Goals for the BPL Innovation Station! BPL will be the location for projects that provide community engagement. Complement and correlate with the school’s S.T.E.M. program. Begin Innovation Station with teens and adults, with children’s programming in 2015. Provide “project-based” learning for homeschoolers. What type of projects would you like?